Environmental studies professor Greg Gilbert. Photo by Jennifer McNulty. SANTA CRUZ, CA--The first systematic test of how widely pathogens can spread among distantly related plants reveals far greater range than conventional wisdom would suggest, raising questions about the adequacy of current regulatory approaches for plant quarantine and international trade. The results also represent a powerful new tool for predicting the likely host range of pathogens, useful in agriculture, environmental restoration, and ecology. Plant pathologist Gregory S. Gilbert, a professor of environmental studies at the University of California, Santa Cruz, and coauthor Campbell O. Webb of Harvard University's Arnold Arboretum report their findings in the paper "Phylogenetic Signal in Plant Pathogen Host Range," in the Monday, March 12, edition of the Proceedings of the National Academy of Sciences. "Conventional wisdom holds that closely related plants are much more likely to share pathogens, but there's never been a systematic evaluation of that notion," said Gilbert, who devised a new method and evaluated the susceptibility of dozens of forest plant species to 53 pathogens, for a total of 962 fungus-plant combinations. "The risks are far greater than we expected. This research sounds an alarm and provides a new tool for evaluating risk." Gilbert's findings confirm the conventional wisdom that plants within a genus are highly vulnerable to the same pathogens. More surprising, however, was that this vulnerability decreased gradually, with even the most distantly related flowering plants sharing a 27 percent chance of being susceptible to a given pathogen, according to Gilbert. "It is very surprising to see such a degree of shared vulnerability among plants that took different evolutionary paths over a hundred million years ago," said Gilbert. "With this new information, it's clear that arbitrary cutoffs at the genus or family level underestimate the risk substantially." Such arbitrary cutoffs are currently the rule. For instance, in the United States, the Animal and Plant Health Inspection Service (APHIS) has drafted a policy proposal that would restrict importing exotic plant species within the same genus as a known host of a pathogen currently under quarantine, until extensive further analysis could be conducted. "The APHIS model implies that plants outside the genus are not considered a risk, but that is at odds with the empirical data," said Gilbert. "We now know that significant risk extends far beyond the category of genus, and we can assign risk with far greater accuracy than before." With that information, regulators can make better-informed decisions and could focus their limited resources more efficiently on evaluating specific plant-pathogen combinations. Gilbert's findings give scientists and policy makers a tool to predict whether plant pathogens are likely to be able to move from one plant species to another, when costly and time-consuming empirical data are not yet available. This tool may be useful beyond quarantine regulations. For instance, it could be useful in designing agricultural intercropping systems that reduce spread of plant diseases, and in evaluating and reducing disease risks where agricultural and wildlands come into close contact. For instance, along parts of the Sacramento River in California, walnut farmers successfully lobbied to block riparian restoration efforts because they feared the spread of pests from transplants of native species to their orchards. By examining the evolutionary distance between walnuts and plant species in the restored areas, restoration ecologists could identify those species most likely to share pathogens with the valuable crop, and conduct research or adjust restoration practices accordingly. Gilbert's findings can also be used to help evaluate risks of introducing biological control agents, such as the introduction of fungal pathogens to control the devastatingly invasive yellow star thistle. 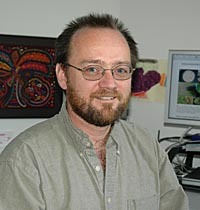 Gilbert conducted his research during 2005-06 in Panama, where he examined the impact of 53 fungal pathogens on plants across the range of "phylogenetic distance," or the estimated time of independent evolution between plant species. He first conducted a study in a nursery setting where he used seedlings of 45 species of tropical forest trees grown for reforestation projects, all native to Panama's forests but not a naturally occurring mix of species. The second study took place in three plots in mature rain forest. Pathogens were cultured from specimens gathered from each location, and leaves inoculated in the field. Overall, there were 384 fungus-plant pairs in the nursery and 578 pairs in the forest study. "These pathogens are a lot more likely to be hitting a lot more kinds of plants than we thought, because no one went to the trouble to do all the tests," said Gilbert. He is expanding his research to evaluate the severity of damage caused by pathogens, from inconsequential to lethal, and he has begun collecting data on soil-borne diseases to conduct a similar evaluation of plant vulnerability to those pathogens. Note to journalists: Gilbert can be reached directly at (831) 459-5002 or via e-mail sent to ggilbert@ucsc.edu. He can also be reached through Jennifer McNulty in the UCSC Public Information Office at (831) 459-2495 or jmcnulty@ucsc.edu.